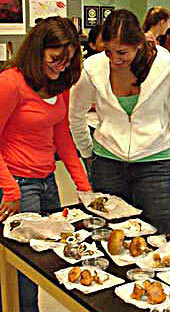 This page describes our lab's outreach activities involving high school teachers and students. Workshops and short courses. Our lab hosted a series of two-day workshops (in 2003, 2004, and 2006), and two-week short courses in fungal biology (in 2003 and 2004), with support from several different NSF research grants, including the Assembling the Fungal Tree of Life (AFTOL) project (see Current Research). Both the workshop and short course have been given for free, and have conferred Professional Development Points for teacher recertification (awarded through the Clark University Department of Education). Future workshops will be announced here. The two-day workshop is an intensive, content-based program that provides an introduction to fungal biology, with an emphasis on ecology and evolutionary biology of basidiomycetes. 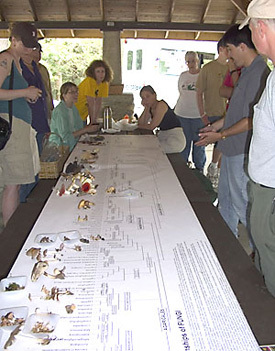 In the 2006 workshop, we made a field trip to collect mushrooms, and we attempted to identify the species and construct a phylogenetic tree based on morphology. We also used molecular sequences (provided) to perform exercises in fungal molecular ecology and fungal phylogenetics. Course documents, including notes for activities in fungal molecular ecology and evolution, can be downloaded here. The two-week short course is a hands-on research experience in fungal molecular systematics and molecular ecology. 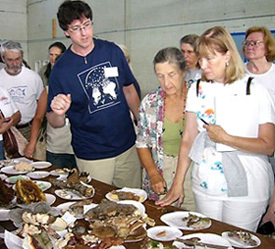 Participants collect and identify mushrooms, obtain molecular sequence data, and use bioinformatics tools to confirm identifications and estimate evolutionary relationships of their specimens. See an outline of the 2004 short course. Teaching the Fungal Tree of Life web site. As part of the AFTOL project, we are developing a web site called Teaching the Fungal Tree of Life that provides information about fungi for high school biology teachers and other educators. The site emphasizes recent research in fungal ecology and evolutionary biology, and is intended to provide a link for educators to recent primary literature. Collaboration with Acton-Boxborough Regional High School. We are collaborating with Brian Dempsey, who is a biology teacher at ABRHS, to develop a learning module for high school students, based on fungal molecular ecology. We ran our first classes in 2005 and 2006, and will repeat the module in 2007. In the summer of 2006, Brian did research in our lab with support from a NSF Research Experiences for Teachers supplement. This work was described in an article in The Science Teacher (PDF). We would welcome inquiries from other teachers who may be interested in the RET program.